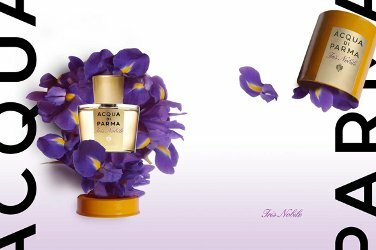 Acqua di Parma launched Iris Nobile in 2004, and the original version, in Eau de Toilette concentration, is one of my favorite summer perfumes, a beautiful blend of iris and orange blossom with just a hint of anise. This year, Acqua di Parma follows up with an Eau de Parfum version that puts a chypre twist on the original formula. Notes include bergamot, tangerine, iris, star anise, ylang ylang, oakmoss, vanilla, amber crystals and patchouli. As you would expect, the Eau de Parfum is a denser, richer fragrance than the Eau de Toilette. The sparkling, summery feel of the original top notes has been replaced with something darker and flatter, and the anise and the orange blossom have both been toned down a notch. The heart is earthier, marginally sweeter, and more directly focused on the iris notes. The iris continues to intensify into the base, which features a woodsy patchouli-oakmoss blend tinged with amber and vanilla. As advertised, it has the feel of chypre, but rendered here with a very modern touch — if you think you don't like chypres based on old-fashioned versions like Miss Dior, Guerlain Mitsouko or Grès Cabochard, fear not, Iris Nobile doesn't have that musty feel that heavy concentrations of oakmoss and/or patchouli can lend. I was very excited when I heard about the Eau de Parfum, but what with one thing and another it has taken me months to get around to obtaining a sample and actually trying it on skin. It is just as well as it is more of a fall than a summer scent. It is still not a heavy fragrance, mind you, but those who complained about the lasting power of the Eau de Toilette will be pleased with this new version, as will those who were disappointed to find that the original was as much about orange blossom as it was about iris. I still haven't decided if I need it. It is nice enough, but it certainly isn't going to replace any of my deeply adored iris favorites like Bois d'Iris, Hiris, Iris Silver Mist or L'Homme de Coeur, and for that matter, I think I still prefer the Eau de Toilette. I will try it again as the weather gets colder and see what happens. The Eau de Parfum version of Iris Nobile is available at Neiman Marcus, and should eventually be everywhere the line is carried; see the listing for Acqua di Parma under Perfume Houses for more details. I agree with Bela, R. Those notes do sound intoxicating. I tested the EdT version last year, but it faded…quickly! Maybe the EdP is a bit stronger and long-lasting but, even though the notes sound lovely, I will not hold my breath. R, for someone who loves anise, iris and orange blossom, this sounds like a dreamlike fragrance. Just checked out the review for the original IN and must say that I'm wary of its longevity, despite the fact that I would probably love it. Is the parfum just a stronger, darker version of the EDT or a different jus altogether? I feel sure I would love it, but whether I'd be able to pull it off on my male skin is something I need you to tell me. Is it more feminine than ISM, which I adore ? R, I think Bela might have meant “disgusting” more than “intoxicating”…the EdP is definitely stronger — I can still smell it after showering, which is far more than I can say for the EdT although even that lasts several hours on me. I would say the EdP is enough of a different jus altogether that I'd try both before you make up your mind. To my mind, the longevity of the EdT is acceptable, but I know some disagree. It is definitely a scent that needs to be sprayed liberally though. A little dab from a vial will not impress you. And, it is more feminine than ISM, but still, I don't *think* it is too feminine for a man to wear. Looks like there are some masculine reviews of the EdT on Basenotes, anyway. Somehow those cues don't translate well on the internet, do they, lol? Oh well! Sorry about that. Anyway, I DO like the combo of notes, so I will test it if I see it. I read your review on Elixir de Merveilles and emailed you. You're right, R (you know me well): iris and anise are two of my least favourite notes, and orange blossom as well, unless it's completely unrecognizable. Oh, I don't know. LOL! Do *you* run away screaming from things you like? J, looks like you aren't going to be needing a bottle of Iris Nobile, LOL! BTW, have you tried Mandarin Mandarine yet? Good, bad, indifferent? Nope! Re. M-M, I've only sniffed the wax sample. Thought it was very close to Fd'O but who can really tell. I'm always the last to try the juices (I still haven't smelled Chêne IRL) so I wouldn't hold my breath for my opinion on it. LOL! This I know, if a woman has this on, to paraphrase ALTennyson…”my whole soul thru my lips” is physically possible….the EdT was too weak, but mama this is it. Wow, that is quite a testimonial! M, I think you would like this one…will be curious to hear what you think of it. Never mind the scent, I like the sound of Robert. Actually, I love the edt but I think your description of the edp as flatter is spot on. I'll be sticking with the edt. This is a nice scent and I prefer the eau de parfum. However, it will never replace Hiris. I have the body cream and it is wonderful! For some reason, it smells better than the parfum. If the parfum smelled this good, I would wear it more often. Oh, which body cream, Iris Nobile or Hiris? Assuming you mean the Iris Nobile since I don't think there is one for Hiris — and so I'll have to try it! I have the Iris Nobile body cream and I love it. As a moisturizer, it is the best. And the smell….why can't Iris Nobile smell just as good? Well, I adore Iris Nobile (the EdT, anyway) so must try the cream. And with you on the Hiris! Today, I unearthed a sample of the Eau De Parfum that I received last May when I bought th Arancia di Capri (part of the Blu Meditteraneo range). It is strange that I should stumble upon it now as I have been wanting to get an Iris scent for a few weeks now. Perhaps it is because of Prada's Infusion di Iris, which I like very much but can't bring myself to buy simply because it is a Prada! I will try the Acqua di Parma and see how it goes. But am I the only person who is a fan of the Prada but hate the label? I pay very little attention to fashion labels, so therefore have no problem w/ Prada, and adore Infusion d'Iris. This one is nice too though! I am absolutely in love with the scent of iris. I think iris is the new gardenia or the new jasmine… so many brands make iris fragrances now, but it's not as popular as rose or lilly perfumes so I'm happy. I like to stand out, I like to be unique. My perfume has to be different and iris is an awesome flower! There seems to be more people falling in love with the iris but it's not overly used everywhere so it's all good. I loooooove Iris Nobile and I loooove acqua di parma, I also looooove their fico di amalfi. They make their scents smell not too overwhelming, but hey they rock and make a statement. Perfect niche brand, two thumbs up! I feel just the same way about Prada's Infusion D'iris! When I smelled it for the first time, i thought it was a great scent. Didn't smell like something that “Prada” would make, smelled very niche. But when I think it's Parda, You know? Prada, great bags, awesome gowns, can't afford them but love them… but my perfume world is a very special place to me. Every fragrance evokes different places and memories to me. I am in love with the iris flower so I am enjoying my Iris Nobile very much, however just can't make myself buy the Prada one. I am thinking about buying another iris fragrance, It's somehow hard to find Silver Mist to me, don't know what I'm doing wrong, also Iris Noir by Yves Rocher is not even in US yet, I don't think. Iris Pallida by L'artisan also seems like a crazy idea, so hard to find a sample, too expensive to buy without smelling first… then iris poudre could be considered! Those 10ml bottles could be an idea, even though it's 90 bucks for only 3 of them… better than almost 300 dollars for 100ml of something i might not even like. Hiris is also something I think I might try, I don't know, but iris is so special to me I just want to wear it more and more… I am enjoying every bit of it! You can only buy Iris Silver Mist in Paris, or if you live in Europe, you can have it shipped to you. Iris Pallida — you can buy samples online. I'm not loving the YR Iris Noir, sadly, but Hiris is one of my favorites. I just got my Iris Pallida decant (thank You nowsmellthis, for Your tips!) I am loving it! Also I've tried Hiris, mmmmmmy god, this couldn't be any better! By the way, I am in love with this blog, I mean, what a GREAT help for a little perfume freak like me. All the reviews, comments, everything so clear, easy. Thank You so much, I am enjoying this blog very much, even just reading it! The reviews helped me so much already that I am loving You guys!!!! *I meant Iris Poudre lol. All I think about is Iris, Iris, Orris, Iris… and I'm getting all confused LOL. I still haven't smelled Iris Pallida, just tried Iris Poudre by Frederick Malle. When I first tryed this one I thought it would make an exellent bathroom smell but not a person smell. Now I want it for myself. Very nice, very natural smell. Excuisitely clean and elegant. I tried it again recently, and nope — still don’t love it nearly as much as the EdT version. Shame, because they keep doing cool LE bottles for the EdP.